"�and they called them The Apple Dumpling Gang." 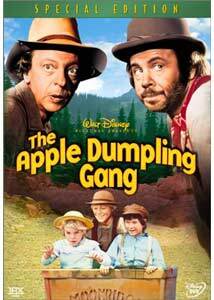 Although not in the same league as Mary Poppins or endearingly goofy as the teenaged Kurt Russell comedies, Walt Disney's The Apple Dumpling Gang has earned a soft spot in many of the studio's live-action aficionado's hearts for its gentle family comedy, keen period detail and the first-time teaming of comedy legends Don Knotts and Tim Conway. Set in the 1800s, our story centers on roving gambler Russel Donavan (Bill Bixby) who becomes instant daddy to three orphans presented as the "valuables" of one John Wintle (Don Knight), an unlucky loser in a recent card game who's turned the tables on his opponent to say the least. Not ready to settle into the role of single father, Donavan tries in vain to pass the youngsters off onto prospective parents, but no takers... at first. Without strict parental supervision, the kiddies wander into the hills and with a little help from Mother Nature, become the lucky recipients of a super-sized gold nugget. Suddenly, everyone wants to play Mommy and Daddy! But that's not the only hurdle in the way as two bumbling outlaws (Knotts, Conway) estranged from their former gang, want to collect the booty... unless their old cronies headed up by the mean 'n' ruthless Frank Stillwell (Slim Pickens) get to it first. Somewhat slow and tedious by today's fast paced standards, Dumpling will play better in the eyes of the older Disney faithful, western lovers in the mood for something lighthearted and fans old enough to remember such familiar faces from the 1970s as Bixby (television's future David Banner from The Incredible Hulk), M*A*S*H's Harry Morgan, and of course, Conway and Knotts, whose timeless slapstick provides many of the film's high points. Susan Clark also captivates as a Calamity Jane-esque character who plays a significant role in the children's lives. Image Transfer Review: It's nice to see the House of Mouse putting the same kind of pristine care into their live-action films on DVD as their animated classics. Save for a couple of instances where incorrect fleshtones are noticeable and some occasional stray specks, this is a very warm and pure transfer that recaptures the inviting look of your typical mid-'70s family Disney flick. Sharpness, contrast and black levels are very good, too. Audio Transfer Review: Though the packaging indicates 5.1, it's actually a nicely configured mono track. Effective ambiance is fed to the front and the rears with the untampered original mono track resting firmly in the center channel; bass is never really a factor except during musical passages and even then, it's lacking. But I'd rather have this kind of setup than unnatural low frequency trickery calling attention to itself. Extras Review: In the tradition of their jam-packed animated titles, a healthy heapin' of bonus nuggets are all over this dual-layered disc. Fans of Knotts and Conway may be intrigued by their appearance on the commentary, but I should warn you that their presence is unfortunately limited to their time on screen. So, that leaves fellow participants Susan Clark and Brad Savage (recorded separate from the comedy duo) to hold the floor for most of the nearly two-hour running time. Although a little slow out of the gate, Clark proves to be a very technical and quite informative co-host via her (mostly vivid) memories of the filming (Bixby's Cary Grant influence; working with seasoned pros like Morgan, Arnold, and McGiver. Although the Knotts/Conway bits are sometimes little more than narration of on-screen action, Conway's off-kilter way of seeing things is truly original and more often than not, very funny (as you'll hear by Knott's consistent laughter). Even better than the commentary? Conway's 11-minute Conversations showcase, a breezy reminiscence of his early days in the business and his lengthy mid-career tenure at Disney. Barely ten seconds in, the late period Carol Burnett Show regular had me breaking up like he'd have Harvey Korman do in the middle of a sketch. Even approaching 70 in December (although looking much younger), the man truly remains one of the funniest people on the planet. Though it repeats many bits of information in the commentary, the nearly half-hour-long A Look Back featurette gives us a chance to see what the Apple Dumpling kiddies look like all grown up (and making us feel older in the process, thank you very much) as well as contributions from almost all of the main players (Clark, Conway, and Knotts), who have nothing but the most upbeat recollections of their experience (Knotts called it the best experience of his film career) and sincere praise for Disney's devotion to the finest detail in cinematic craftsmanship. Completing the bonuses are a vintage Disney animated short (Two Gun Goofy), a cool look at the history of Disney's back-lot (Lost Treasures), clips from 1975 Disney productions collected in the Studio Album retrospective, a salute to Disney's most memorable Western characters (Rootin' Tootin' Cowboy Heroes), and a wide assortment of promotional materials featuring lobby cards, stills, and star biographies. Though far from classic, The Apple Dumpling Gang is a watchable, entertaining couple of hours enlivened by the presence of some of the '70s top-notch character actors and the first time union of Don Knotts and Tim Conway.